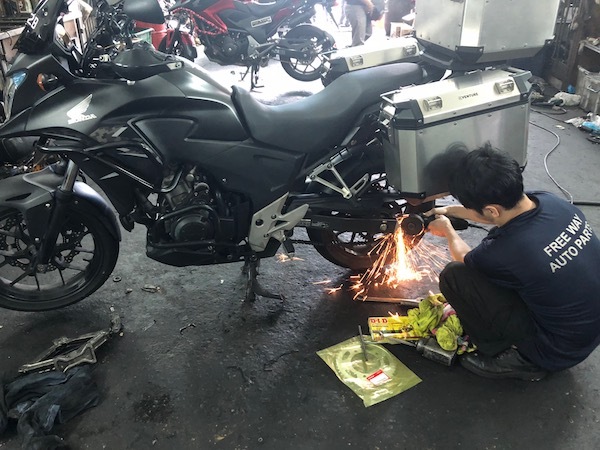 After traveling some 2,000km and taking my 400X on my first road trip to Thailand, I’ve come to realise that the speedometer and odometer (or tripmeter) readings are waaaaaay off. While I understand that most vehicle manufacturers build the speedometer to overestimate the actual speed, my Honda was actually UNDERESTIMATING instead! As I have my handlebar-mounted GPS turned on throughout the journey, I noticed that while the speedometer was reading approximately 100kmh, my (GPS) actual speed was 106kmh instead! And to add to the problem, my odometer / tripmeter readings are way off too. While comparing notes with several fellow riders, the distance between 2 refuel stops should have been about 220km apart – my trip meter was reading 197km only. To confirm this irregular phenomenon, I took a mental note on the distance to the next destination on my GPS – approximately 135km. But when I arrived, my bike showed that I have traveled for only 120km! This odometer / tripmeter under-reading is also causes fuel economy / mileage mis-calculations. As I compared notes with the other CB400X rider in the group, between refuel stops, we used up about the same amount of fuel (which makes perfect sense – same bikes, same distance covered, about the same amount of fuel consumed). But her calculated and indicated mileage works out to be about 25kmpl while I’m getting about 22kmpl! So during the journey and over the Sena bluetooth comms with the other riders, I starting theorizing what the problem could possibly be. It was then when I realised that while my previous Pulsar’s speed sensor is mounted at the front wheel area, the CB400X’s speed sensor is gearbox / sprocket mounted. And so if the previous owner had modified the sprocket ratios, this would affect the speed and odometer readings! In any case, I suspect that my chain is reaching its end-of-life as it seem to need another adjustment after just 2,000km from the previous one. And since today’s a Bike Admin day, I took it for a sprocket / chain replacement. Original Honda OEM front and rear sprockets (15/45T) and DID 520 x-ring chain. 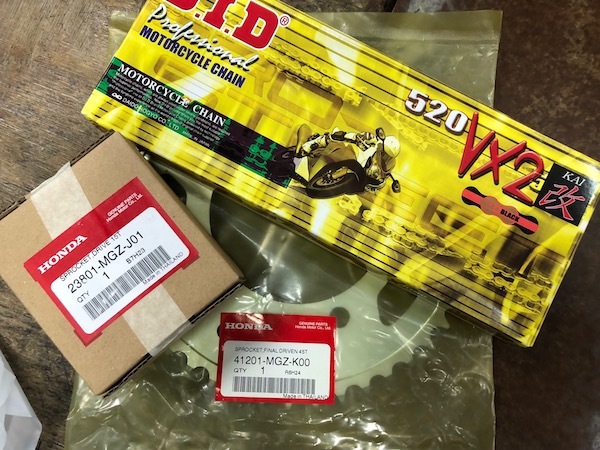 The Honda OEM sprocket sizes for the CB400X are 15T front and 45T rear. While the manual calls for a DID 520 o-ring chain, I decided to go for the x-ring version as I had very good experience with it on my Pulsar. Removing the old chain and installing the new one. 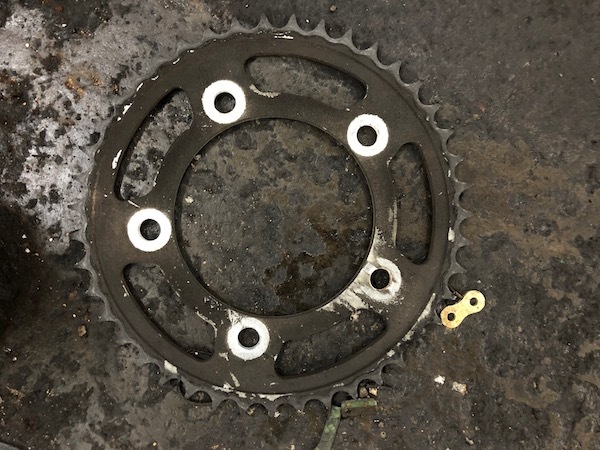 And when the old sprockets were popped out from my ride, I immediately confirmed my speed / distance misreading hypothesis – the sprocket ratio has been altered from OEM. 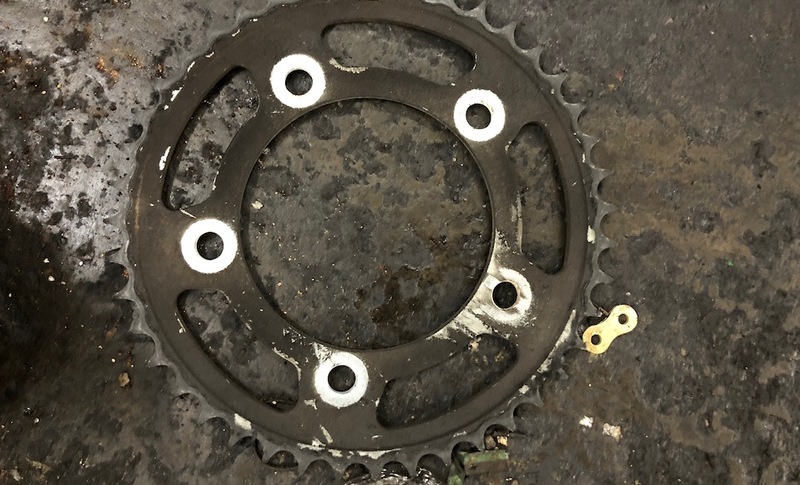 The removed front sprocket – 16T. 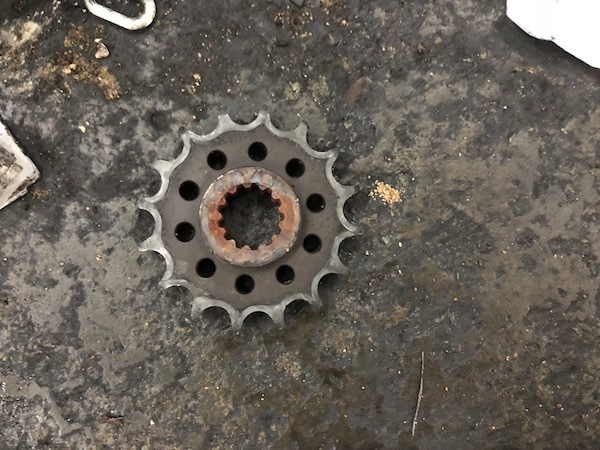 Removed rear sprocket – 43T. Comparing the old 16/43T sprocket ratios with the OEM 15/45T, there’s a significant 10% difference between the OEM and the modified ratios. This explains why the Honda has been displaying speeds that are slower than it really is, distances shorter than it really is, and therefore mileage that is lower than it really is. So with the new OEM setup, my Honda CB400X should now be more truthful in it’s speed, distance and mileage reporting. Been geared for touring/top speed. Use a speedo healer to correct for that in the future if you need it. Would prefer to stick to stock. Although top speed is “increased”, it didn’t seem to have the torque to achieve that. Bike started feeling sluggish after 130 on the NSHW. One (perceived) advantage that I thought of was fuel economy. But when I compared the fuel used between fuel stops with another fellow 400X rider in the group traveling the exact same route, we seem to use about the same amount of fuel. So no savings there. 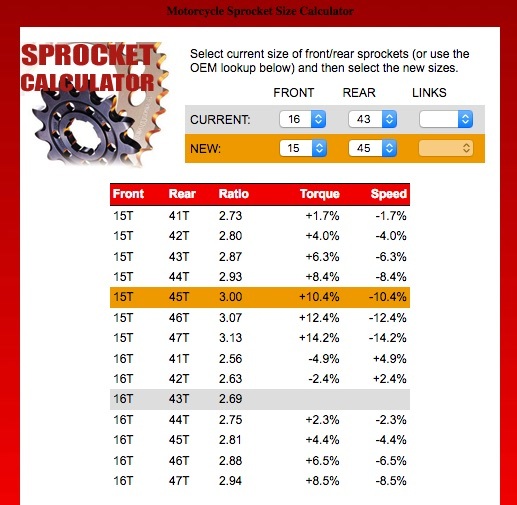 Hi i want to change my sprocket size to increase pick up speed. Which would u recommend?. Not a recommendation, but just a warning – unless you get a speedo-healer, your speedometer AND odometer readings WILL BE INACCURATE!